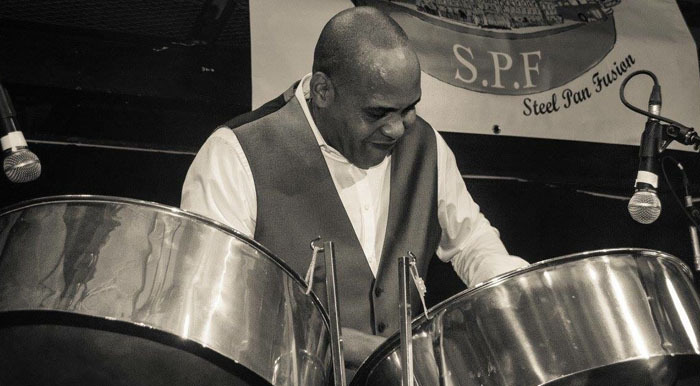 A traditional West Indian steel pan ensemble instantly evokes the laid-back sunshine spirit of the Caribbean at your wedding reception or celebration party. The Wade Austin Steel Band presents you with toe-tapping rhythms and soft, easy-listening melody. 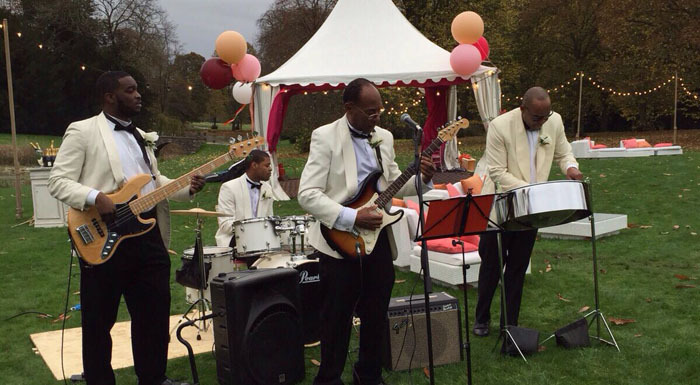 The music can be completely acoustic, making this steel band an ideal option for an outdoor occasion, the perfect backdrop for a summer barbecue or a garden party. If music for dancing is required, the band can perform with backing tracks. A compact duo or trio from The Wade Austin Steel Band is eminently suitable for smaller, more intimate events. However, to entertain a larger audience, the band can readily expand up to an impressive six-piece outfit. Rest assured, whatever line-up you choose, The Wade Austin Steel Band will include all the tried-and-tested West Indian favourites in their performance, together with effective arrangements of popular tunes from their ever-expanding repertoire, so you can look forward to hearing well-known Caribbean classics such as ‘Island In The Sun’ and ‘Yellow Bird’. It’s beach-party time – sample a real carnival atmosphere, Trinbago-style, when The Wade Austin Steel Band strike up their chiming steel pans. Thank you both very much for playing at our windmill wedding on the Norfolk coast. Your steel drums contributed wonderfully to the atmosphere and sunshine on our wedding day. We would thoroughly recommend the Wade Austin Steel Drum Duo…they did an amazing job playing requested songs, from “Pachelbel`s Canon” to Bob Marley`s “Three Little Birds”. Wade and partner were super friendly and adaptable and everyone enjoyed the steel drum workshop. Thank you both and we will send you a photo when we have them back! I had a brilliant night on Saturday thank you! The Wade Austin Steel Pan Duo were absolutely incredible. They played as all the guests were arriving during the drinks reception. Everybody commented on how good their sound and energy was. It created a great atmosphere and I would definitely recommend them/use them again. Thank you,! Wade is a really friendly, professional guy who is passionate about his music. Thank you for making our party extra special and we would highly recommend him for any event!! The party was a brilliant success and Wade made it extra special. Everyone really loved Wade Austin and his music! We had such a great time and we would highly recommend Wade. Thank you HTYD for putting us in touch with him. Just a quick note to let you know all went very well last night. Wade Austin and Mark turned up well in time for their performance and were extremely polite and accommodating in all respects. Wade is quite a personality and we had great fun talking to him after the performance. They are great musicians and they certainly made a lot of friends down here. If anyone is looking for a steel pan set-up or similar I am sure they will turn to them as their first port of call. Our team would like to say a massive thank you from the bottom of our hearts for the brilliant contribution from The Wade Austin Steel Band which make our event such a huge success. We didn’t think it would be possible to improve on last year’s performance – but how wrong were we! Wade and his partner rocked the show and the feedback received was incredible. The event was thoroughly enjoyed by everyone and we will not have been able to do it without your support, dedication and hard work – thank you! Just an email to say the guys from the Wade Austin Steel Band were great on Saturday! They turned up promptly, looked great and were so friendly. We would definitely book them again. Please would you thank Wade and the band very much for attending our Fun Day on Friday 15th June. It was a pleasure to meet them and both residents and staff were delighted to watch, dance and listen to such a versatile repertoire. The weather was disappointing but it didn’t dampen our enthusiasm. I do hope we have an occasion to book the band again. Thanks very much, Steel band was great, fantastic sound!